This new premium product offers all of the features of the original Alpha but with the convenience of CLASS I laser specification, allowing hassle free operation on today’s “laser safe” construction sites. Made in California, it comes with a 2 year warranty. 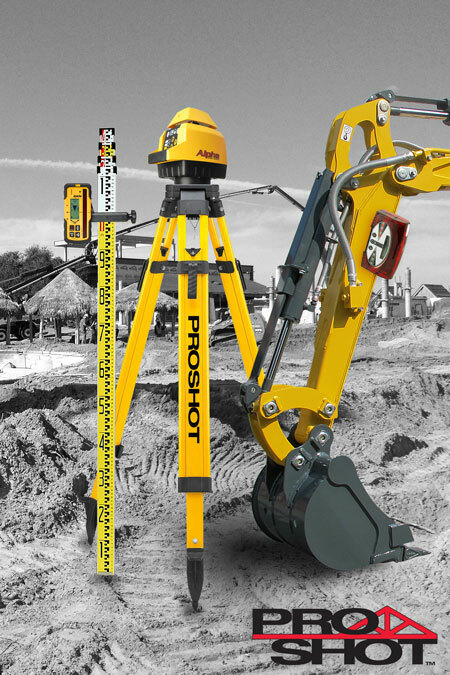 The Pro Shot Alpha 1 is a compact and robust construction grade automatic level with class leading features. Designed and manufactured in California, the Pro Shot Alpha construction laser is designed for earthmovers, concreters and general contractors that require a reliable and accurate laser to meet their needs year after year. The Pro Shot Alpha 1 features electronic self-levelling with no foot screws for quick and precise automatic levelling. The Alpha also has the added functionality of a manual grade, which is controlled by up and down arrows on the keypad. Unlike other lasers that have a grade override function, the Alpha can be precisely aligned to match slopes – even at longer distances. While operating in grade mode, the Pro Shot Alpha 1 self-levels in the cross axis and the height alert is active to ensure quality results. This laser surpasses most of its competitors. The Pro Shot Alpha is made in California, USA and comes with a 2 year warranty. With a Class 1 laser classification, Safework Australia deems the Pro Shot Alpha 1 to be safe for use under all conditions of exposure. That makes it the only laser in its class that can be used on any site in Australia without the need for a safety officer, signage or laser operator training. Larger civil companies have increasingly strict site safety requirements, having a hassle free Class I laser onsite could mean the difference between continuing your work and being kicked off site – saving you time and money! For use in building and construction industry? Each Pro Shot Alpha is hand manufactured and tested at Laser Reference in California, USA. Unlike rival brands, Pro Shot lasers have low ongoing maintenance and repair costs – authorised repair centres still repair and stock parts for units well over 15 years old. Uneconomical write-offs are an uncommon occurrence with Pro Shot Lasers. Reasonable parts pricing and warranties mean your Pro Shot laser will be your onsite companion for many years into the future. With authorised Australian dealers and repair centres in every state and capital city, you'll never be short of support for your Pro Shot. For grading applications such as driveways, drainage and carparks, the Alpha can be driven to match any slope up to ±8%. 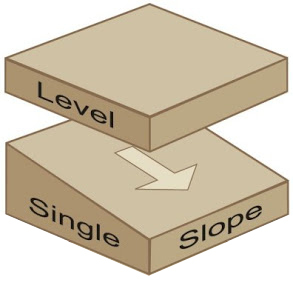 Unlike other lasers, once a grade has been set the Alpha's self-levelling function is still operating. If the laser is knocked, or temperature/vibration has caused a height variation, the laser is still able to compensate. For laser guided machine control applications the Alpha's got you covered. A high speed 1200RPM mode has been built in that will give you twice as many laser strikes per second than other lasers in this class. What does this mean for the operator? Smoother control and higher accuracy. With 115 operating hours, the Alpha 1 has one the longest operating times in the market. This laser will give you over a month of operation using just a single set of batteries. 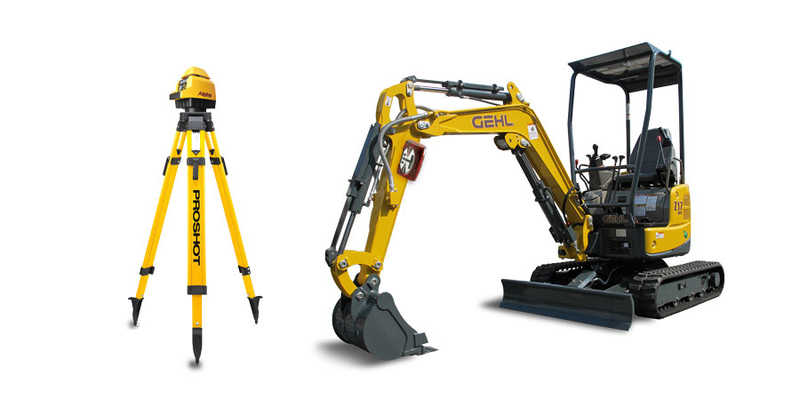 We understand that no two contractors are the same, so we've tailored kits to suit earthmovers, concreters, general builders – and even billiard table installers! The choice of receivers ranges from simple up and down and on-grade lights to millimetre readouts. Got an excavator, bobcat or dozer? We can package the Alpha with a range of machine display receivers – from display only systems for fast trenching up to fully automated dual hydraulic control systems. Call us to find out what's on offer for your industry. Laser Reference manufactures a range of different rotary lasers tailored to suit different applications. From simple laser levelling to complex cone grades, Pro Shot has a laser to suit your job. The table below outlines the key features of each model. Feel free to contact us if you'd like our recommendation on which model would best suit your needs. A Pro Shot Alpha construction laser is knocked-over in a paved parking lot then put back on the tripod showing no loss of accuracy, a testament to its job site durability.